Electronic polling directly involves the audience in a presentation. The exact purpose of this interaction must be established in the preparation. The vote itself may leave the presenter with a result that is unexpected or undesired and this may challenge the planned direction or even purpose of a presentation. Technical issues are multiple. Time is also consumed by this. 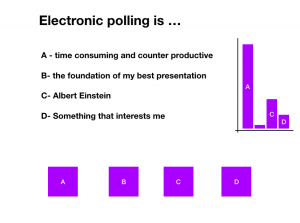 Electronic polling is a risky strategy in a presentation and must be used with care. There is huge value in audience engagement. Electronic polling systems offer a direct method of doing so, gauging opinion and knowledge of the whole group and sharing this. It can be used to tell, test and even change the direction of the piece based on results. The exact purpose of this electronic polling must be established in planning and take account of many possibilities afforded by the result. The question must be straightforward, unambiguous and the options distinct. This itself is challenging if non-binary. The results of a poll that is in alignment with the expectation of the presenter offer emphasis and re-enforcement to a point within the p1. “And, as we can see, the majority of the audience agree that…” The investment to make this should be evaluated not simply by the result. Unless unanimous, potentially itself a poor investment, the result exposes difference. That difference, if expected, may guide the debate of the piece. It should be remembered though that holding a contrary view is one thing; being exposed, even anonymously, is very different. The reasons for the alternative stance may be simple, knowledge or experienced based but may also be more complex than the answer posed. They may even be as simple as pressing a wrong button. To be effective, electronic polling systems need to be universal, simple to use and effective. The best way is to use dedicated devices. There is a huge cost in time and effort. All devices must be checked individually before a labour intense distribution and subsequent retrieval. There are smartphone services. Most, but not all, audience members will have such a device but they may not have a data package, decent phone signal or even power at that precise time excluding them from the vote. Locally provided wifi is hugely unreliable at the best of times and may collapse under the stress of the whole audience polling at one time. Disenfranchising individuals by any of these will challenge the value of the message, add distraction simply by activating mobile phones and must, therefore, be weighed for ultimate valume. Once a system is selected, distributed and actioned this must be embedded into the presentation. The complexity of this must not be underestimated. Bespoke systems will need effective Bluetooth or wifi connections. The presentation software must be compliant and able to show real-time results in an appropriate graphical representation. And even this tallying takes time due to delays in polling, collation and calculation. This cannot be effectively quantified ahead of time but will hugely reduce the time available for discussing the result obtained. Such investment must be balanced against the hoped-for result of electronic polling. The physical act of “voting” is valuable but as The BBC might say, “other polling options are available.” A personal note, raising of hands (even with eyes closed) or simply choosing from a list may achieve the desired impact without the investment and risks of electronic polling. Consider the overall balance of cost, effort and reward before deciding on electronic polling. I share your concerns about the technical intricacies. That being said, in times of inverted-classroom-like talks, audience response systems are a mere necessity. tweedback is German but has some great functionality for free. I wonder what other online-services, if any, readers of your blog use. Thanks for the comment. “A necessity”? really? Why? Can I be controversial and say I like polling systems in particular I use zeetings. Zeetings lets you up load your PowerPoint and then you can add polling slides where ever you want in the presentation. It gives the option of multiple choice or free text, or thumbs up and down. People follow the presentation and participate using their smart phones. The two places where I use polling for the fun talks I do, purely for some amusement and wow factor. The other is in groups I know that are not very interactive. This systems means people can answer without feeling like they are picked on. Are they necessary…absolutely not, but I enjoy it and zeetings takes another 5 minutes after your presentation to set up online so is not time consuming. Oh as an aside thanks for the really good website I was the education registrar in my hospital and it really helped me step up presentations. Not controversial at all! thanks for the comment. Never used Zeetings. The “wow” is good as long as it is valuable, both for content and not just that folks did a wow thing but that it adds to the overall (p cubed) value. When you have used it, what was your experience with operating systems and phone signal? Thanks also for comments regarding website. So will answer about the operating system first. You upload your presentation to the zeetings website. So at the start of the presentation you have to log onto their website and then can start your presentation. So the set up does not work if you do not have access to the internet (which is rare since usually there is wifi or I just use my phone as a hotspot). Once the presentation has started everyone on their phone goes to the same website so when I present everyone would log onto http://www.zeetings.com/Anu (if you log onto that now you will see that it tells you I am away at the moment and not presenting). So the good thing is that people do not have to be on the same wifi network or anything. As long as you have a smart phone/tablet/laptop that can access the internet you can follow the presentation and do the polling. The free package lets you have 15 followers. I have the educational package (which previously you did not have to pay) and can have 200 people following the presentation on their phone. So in theory you could be anywhere in the world following the slide show (not very useful since you cannot hear or see what the person is saying). Every time you move slides back or forth it has like a half second delay to change on the phones. Try the free version, I think as polling programs go this is one of the easiest one to use. As for when I have used them. Used in a small group tutorial (20 people) when I was doing mcq practice for the fellowship exam. Saved have to say “put up your hands if you think A is the answer, now who thinks B….etc”. People could commit to an answer and not be embarrassed in front of their colleagues. After everyone answer you click to the next slide and it gives you the stats of who answers which question. I have also used it in grand rounds with around 100 interns. We had a new bunch of interns and had noticed they were a really shy bunch that in previous lectures trying to get them to interact was painful. So being Generation Y we figured make them use their smart phones to interact after all isn’t that what they are used to 😉 . I don’t use it for the wow factor to take away from the presentation, but people have usually not used zeetings before so they find it amusing. Oh yeah the first slide I have in the presentation as people walk in is a slide saying everyone should open up zeetings.com/Anu , there is no signing in or logging on or anything. In a keynote environment (100+ audience members), I find digital polling and Q&A to be a considerably more interesting experience than the classic “show of hands” routine. Digital feels accurate, interactive and real-time whereas “show of hands” feels inconclusive and subjective – leaving the presenter to draw whatever conclusion he or she wanted to anyway. Of course, as the article suggests, all technology should be heavily tested beforehand. Sli.do is a great audience participation tool that worked more or less flawlessly throughout SXSW (in very competitive cell / WiFi areas) and its Q&A with upvoting feature helped democratize the interactive portion of these sessions, allowing the audience to ask thought-provoking questions to Elon Musk and Bernie Sanders during the sessions I attended. It’s important to have a strategy in place though as the article suggests – too many presenters use a feature simply to use a feature and don’t consider how to incorporate it (and all possible responses) into their presentation flow. Thanks for the read, cheers! Does digital allow audiences to be a bit intentionally silly too though? to vote for something just to be the “odd man out”? Any actual experience of setting such a thing up? Clearly SXSW and Elon Musk will have a fairly significant tech support crew. What about for Jo Average? A) Depends on how you structure your questions / polls – if that’s a concern, you can disable an “other” or open-ended response option. Sli.do looks interesting. Have never used it before. It does look like you have to run it in the back ground and have to swap between your presentation and the program when you want to want to run the poll. I like the fact that you can make more polls on the fly. But you actually do not see Elon musk standing by the laptop swapping the presentation and making polls, which means you have someone else controlling it which is fine if you have a team. Also it requires you to have internet because you have to log onto the poll area through your website. In this context zeetings does the same thing but you do not have to switch programs since your polls are directly in your presentation (by the way I get no money from zeetings so am not in any way promoting them, just what I am used to). Also zeetings the top tier allows for 500 followers. As for people being silly…yes I put up a picture of Hippocrates and put up a poll saying “who is this” and people could type in their answers which showed up in real time on the screen, and somebody put “old Greek guy”…which got some laughs and since it was just 10 of us at the meeting we knew who it was. And yes I realise with 10 people I probably did not need zeetings but was testing it out to see how reliable it was and better to test in a small group first. Hey Anu! I’ve traditionally used it via the web app and switched between my presentation and the online results page as you pointed out but I believe they now have a more cohesive experience through new features they’ve released – I haven’t fully tested those yet. I don’t have experience with Zeetings but my favorite thing about Sli.do is its ease of access – no installations, all accessible via the web app on any device, very reliable and functional with only the tiniest of cell / WiFi signals. Whatever the platform though, I’m all for promoting new ways of audience engagement and I believe modern audiences are more appreciative of these interactive elements…when done professionally and effectively!